For other uses, see ENIAC (disambiguation). University of Pennsylvania Department of Computer and Information Science, 3330 Walnut Street, Philadelphia, Pennsylvania, U.S.
ENIAC (/ˈiːniæk, ˈɛ-/; Electronic Numerical Integrator and Computer) was the first electronic general-purpose computer. It was Turing-complete, digital and able to solve "a large class of numerical problems" through reprogramming. Although ENIAC was designed and primarily used to calculate artillery firing tables for the United States Army's Ballistic Research Laboratory, its first program was a study of the feasibility of the thermonuclear weapon. ENIAC was completed in 1945 and first put to work for practical purposes on December 10, 1945. ENIAC was formally dedicated at the University of Pennsylvania on February 15, 1946 and was heralded as a "Giant Brain" by the press. It had a speed on the order of one thousand times faster than that of electro-mechanical machines; this computational power, coupled with general-purpose programmability, excited scientists and industrialists alike. The combination of speed and programmability allowed for thousands more calculations for problems, as ENIAC calculated a trajectory in 30 seconds that took a human 20 hours (allowing one ENIAC hour to displace 2,400 human hours). The completed machine was announced to the public the evening of February 14, 1946 and formally dedicated the next day at the University of Pennsylvania, having cost almost $500,000 (approximately $6,300,000 today). It was formally accepted by the U.S. Army Ordnance Corps in July 1946. ENIAC was shut down on November 9, 1946 for a refurbishment and a memory upgrade, and was transferred to Aberdeen Proving Ground, Maryland in 1947. There, on July 29, 1947, it was turned on and was in continuous operation until 11:45 p.m. on October 2, 1955. ENIAC's design and construction was financed by the United States Army, Ordnance Corps, Research and Development Command, led by Major General Gladeon M. Barnes. The total cost was about $487,000, equivalent to $7,051,000 in 2018. The construction contract was signed on June 5, 1943; work on the computer began in secret at the University of Pennsylvania's Moore School of Electrical Engineering the following month, under the code name "Project PX", with John Grist Brainerd as principal investigator. Herman H. Goldstine persuaded the Army to fund the project, which put him in charge to oversee it for them. ENIAC was designed by John Mauchly and J. Presper Eckert of the University of Pennsylvania, U.S. The team of design engineers assisting the development included Robert F. Shaw (function tables), Jeffrey Chuan Chu (divider/square-rooter), Thomas Kite Sharpless (master programmer), Frank Mural (master programmer), Arthur Burks (multiplier), Harry Huskey (reader/printer) and Jack Davis (accumulators). In 1946, the researchers resigned from the University of Pennsylvania and formed the Eckert-Mauchly Computer Corporation. ENIAC was a modular computer, composed of individual panels to perform different functions. Twenty of these modules were accumulators that could not only add and subtract, but hold a ten-digit decimal number in memory. Numbers were passed between these units across several general-purpose buses (or trays, as they were called). In order to achieve its high speed, the panels had to send and receive numbers, compute, save the answer and trigger the next operation, all without any moving parts. Key to its versatility was the ability to branch; it could trigger different operations, depending on the sign of a computed result. By the end of its operation in 1956, ENIAC contained 20,000 vacuum tubes; 7,200 crystal diodes; 1,500 relays; 70,000 resistors; 10,000 capacitors; and approximately 5,000,000 hand-soldered joints. It weighed more than 30 short tons (27 t), was roughly 2.4 m × 0.9 m × 30 m (8 ft × 3 ft × 98 ft) in size, occupied 167 m2 (1,800 sq ft) and consumed 150 kW of electricity. This power requirement led to the rumor that whenever the computer was switched on, lights in Philadelphia dimmed. Input was possible from an IBM card reader and an IBM card punch was used for output. These cards could be used to produce printed output offline using an IBM accounting machine, such as the IBM 405. While ENIAC had no system to store memory in its inception, these punch cards could be used for external memory storage. In 1953, a 100-word magnetic-core memory built by the Burroughs Corporation was added to ENIAC. 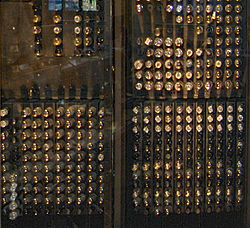 ENIAC used ten-position ring counters to store digits; each digit required 36 vacuum tubes, 10 of which were the dual triodes making up the flip-flops of the ring counter. Arithmetic was performed by "counting" pulses with the ring counters and generating carry pulses if the counter "wrapped around", the idea being to electronically emulate the operation of the digit wheels of a mechanical adding machine. ENIAC had 20 ten-digit signed accumulators, which used ten's complement representation and could perform 5,000 simple addition or subtraction operations between any of them and a source (e.g., another accumulator or a constant transmitter) per second. It was possible to connect several accumulators to run simultaneously, so the peak speed of operation was potentially much higher, due to parallel operation. It was possible to wire the carry of one accumulator into another accumulator to perform double precision arithmetic, but the accumulator carry circuit timing prevented the wiring of three or more for even higher precision. ENIAC used four of the accumulators (controlled by a special multiplier unit) to perform up to 385 multiplication operations per second; five of the accumulators were controlled by a special divider/square-rooter unit to perform up to 40 division operations per second or three square root operations per second. The other nine units in ENIAC were the initiating unit (started and stopped the machine), the cycling unit (used for synchronizing the other units), the master programmer (controlled loop sequencing), the reader (controlled an IBM punch-card reader), the printer (controlled an IBM card punch), the constant transmitter, and three function tables. The references by Rojas and Hashagen (or Wilkes) give more details about the times for operations, which differ somewhat from those stated above. The basic machine cycle was 200 microseconds (20 cycles of the 100 kHz clock in the cycling unit), or 5,000 cycles per second for operations on the 10-digit numbers. In one of these cycles, ENIAC could write a number to a register, read a number from a register, or add/subtract two numbers. A multiplication of a 10-digit number by a d-digit number (for d up to 10) took d+4 cycles, so a 10- by 10-digit multiplication took 14 cycles, or 2,800 microseconds—a rate of 357 per second. If one of the numbers had fewer than 10 digits, the operation was faster. Division and square roots took 13(d+1) cycles, where d is the number of digits in the result (quotient or square root). So a division or square root took up to 143 cycles, or 28,600 microseconds—a rate of 35 per second. (Wilkes 1956:20 states that a division with a 10 digit quotient required 6 milliseconds.) If the result had fewer than ten digits, it was obtained faster. ENIAC used common octal-base radio tubes of the day; the decimal accumulators were made of 6SN7 flip-flops, while 6L7s, 6SJ7s, 6SA7s and 6AC7s were used in logic functions. Numerous 6L6s and 6V6s served as line drivers to drive pulses through cables between rack assemblies. Several tubes burned out almost every day, leaving ENIAC nonfunctional about half the time. Special high-reliability tubes were not available until 1948. Most of these failures, however, occurred during the warm-up and cool-down periods, when the tube heaters and cathodes were under the most thermal stress. Engineers reduced ENIAC's tube failures to the more acceptable rate of one tube every two days. According to an interview in 1989 with Eckert, "We had a tube fail about every two days and we could locate the problem within 15 minutes." In 1954, the longest continuous period of operation without a failure was 116 hours—close to five days. A function table from ENIAC on display at Aberdeen Proving Ground museum. ENIAC could be programmed to perform complex sequences of operations, including loops, branches, and subroutines. However, instead of the stored-program computers that exist today, ENIAC was just a large collection of arithmetic machines, which originally had programs set up into the machine by a combination of plugboard wiring and three portable function tables (containing 1200 ten-way switches each). The task of taking a problem and mapping it onto the machine was complex, and usually took weeks. Due to the complexity of mapping programs onto the machine, programs were only changed after huge numbers of tests of the current program. After the program was figured out on paper, the process of getting the program into ENIAC by manipulating its switches and cables could take days. This was followed by a period of verification and debugging, aided by the ability to execute the program step by step. A programming tutorial for the modulo function using an ENIAC simulator gives an impression of what a program on the ENIAC looked like. ENIAC's six primary programmers, Kay McNulty, Betty Jennings, Betty Snyder, Marlyn Wescoff, Fran Bilas and Ruth Lichterman, not only determined how to input ENIAC programs, but also developed an understanding of ENIAC's inner workings. The programmers were often able to narrow bugs down to an individual failed tube which could be pointed to for replacement by a technician. Kay McNulty, Betty Jennings, Betty Snyder, Marlyn Meltzer, Fran Bilas, and Ruth Lichterman were the first programmers of the ENIAC. Historians had at first mistaken them for "Refrigerator Ladies", i.e., models posing in front of the machine. Most of the women did not receive recognition for their work on the ENIAC in their lifetimes. These early programmers were drawn from a group of about two hundred women employed as computers at the Moore School of Electrical Engineering at the University of Pennsylvania. The job of computers was to produce the numeric result of mathematical formulas needed for a scientific study, or an engineering project. They usually did so with a mechanical calculator. This was one of the few technical job categories available to women at that time. Betty Holberton (née Snyder) continued on to help write the first generative programming system (SORT/MERGE) and help design the first commercial electronic computers, the UNIVAC and the BINAC, alongside Jean Jennings. McNulty developed the use of subroutines in order to help increase ENIAC's computational capability. Herman Goldstine selected the programmers, whom he called operators, from the computers who had been calculating ballistics tables with mechanical desk calculators, and a differential analyzer prior to and during the development of ENIAC. Under Herman and Adele Goldstine's direction, the computers studied ENIAC's blueprints and physical structure to determine how to manipulate its switches and cables, as programming languages did not yet exist. Though contemporaries considered programming a clerical task and did not publicly recognize the programmers' impact on the successful operation and announcement of ENIAC, McNulty, Jennings, Snyder, Wescoff, Bilas, and Lichterman have since been recognized for their contributions to computing. The "programmer" and "operator" job titles were not originally considered professions suitable for women. The labor shortage created by World War II helped enable the entry of women into the field. However, the field was not viewed as prestigious, and bringing in women was viewed as a way to free men up for more skilled labor. For example, the National Advisory Committee for Aeronautics said in 1942, "It is felt that enough greater return is obtained by freeing the engineers from calculating detail to overcome any increased expenses in the computers' salaries. The engineers admit themselves that the girl computers do the work more rapidly and accurately than they would. This is due in large measure to the feeling among the engineers that their college and industrial experience is being wasted and thwarted by mere repetitive calculation". Following the initial six programmers, an expanded team of a hundred scientists was recruited to continue work on the ENIAC. Among these were several women, including Gloria Ruth Gordon. Adele Goldstine wrote the original technical description of the ENIAC. Although the Ballistic Research Laboratory was the sponsor of ENIAC, one year into this three-year project John von Neumann, a mathematician working on the hydrogen bomb at Los Alamos National Laboratory, became aware of this computer. Los Alamos subsequently became so involved with ENIAC that the first test problem run consisted of computations for the hydrogen bomb, not artillery tables. The input/output for this test was one million cards. Related to ENIAC's role in the hydrogen bomb was its role in the Monte Carlo method becoming popular. Scientists involved in the original nuclear bomb development used massive groups of people doing huge numbers of calculations ("computers" in the terminology of the time) to investigate the distance that neutrons would likely travel through various materials. John von Neumann and Stanislaw Ulam realized the speed of ENIAC would allow these calculations to be done much more quickly. The success of this project showed the value of Monte Carlo methods in science. A press conference was held on February 1, 1946, and the completed machine was announced to the public the evening of February 14, 1946, featuring demonstrations of its capabilities. Elizabeth Snyder and Betty Jean Jennings were responsible for developing the demonstration trajectory program, although Herman and Adele Goldstine took credit for it. The machine was formally dedicated the next day at the University of Pennsylvania. None of the women involved in programming the machine or creating the demonstration were invited to the formal dedication nor to the celebratory dinner held afterwards. The original contract amount was $61,700; the final cost was almost $500,000 (approximately $6,400,000 today). It was formally accepted by the U.S. Army Ordnance Corps in July 1946. ENIAC was shut down on November 9, 1946 for a refurbishment and a memory upgrade, and was transferred to Aberdeen Proving Ground, Maryland in 1947. There, on July 29, 1947, it was turned on and was in continuous operation until 11:45 p.m. on October 2, 1955. A few months after ENIAC's unveiling in the summer of 1946, as part of "an extraordinary effort to jump-start research in the field", the Pentagon invited "the top people in electronics and mathematics from the United States and Great Britain" to a series of forty-eight lectures given in Philadelphia, Pennsylvania; all together called The Theory and Techniques for Design of Digital Computers—more often named the Moore School Lectures. Half of these lectures were given by the inventors of ENIAC. ENIAC was a one-of-a-kind design and was never repeated. The freeze on design in 1943 meant that the computer design would lack some innovations that soon became well-developed, notably the ability to store a program. Eckert and Mauchly started work on a new design, to be later called the EDVAC, which would be both simpler and more powerful. In particular, in 1944 Eckert wrote his description of a memory unit (the mercury delay line) which would hold both the data and the program. John von Neumann, who was consulting for the Moore School on the EDVAC, sat in on the Moore School meetings at which the stored program concept was elaborated. Von Neumann wrote up an incomplete set of notes (First Draft of a Report on the EDVAC) which were intended to be used as an internal memorandum—describing, elaborating, and couching in formal logical language the ideas developed in the meetings. ENIAC administrator and security officer Herman Goldstine distributed copies of this First Draft to a number of government and educational institutions, spurring widespread interest in the construction of a new generation of electronic computing machines, including Electronic Delay Storage Automatic Calculator (EDSAC) at Cambridge University, England and SEAC at the U.S. Bureau of Standards. A number of improvements were made to ENIAC after 1947, including a primitive read-only stored programming mechanism using the function tables as program ROM, after which programming was done by setting the switches. The idea have been worked out in several variants by Richard Clippinger and his group, on the one hand, and the Goldstines, on the other, and it was included in the ENIAC patent. Clippinger consulted with von Neumann on what instruction set to implement. Clippinger had thought of a three-address architecture while von Neumann proposed a one-address architecture because it was simpler to implement. Three digits of one accumulator (#6) were used as the program counter, another accumulator (#15) was used as the main accumulator, a third accumulator (#8) was used as the address pointer for reading data from the function tables, and most of the other accumulators (1–5, 7, 9–14, 17–19) were used for data memory. In March 1948 the converter unit was installed, which made possible programming through the reader from standard IBM cards. The "first production run" of the new coding techniques on the Monte Carlo problem followed in April. After ENIAC's move to Aberdeen, a register panel for memory was also constructed, but it did not work. A small master control unit to turn the machine on and off was also added. The programming of the stored program for ENIAC was done by Betty Jennings, Clippinger, Adele Goldstine and others. It was first demonstrated as a stored-program computer in April 1948, running a program by Adele Goldstine for John von Neumann. This modification reduced the speed of ENIAC by a factor of 6 and eliminated the ability of parallel computation, but as it also reduced the reprogramming time to hours instead of days, it was considered well worth the loss of performance. Also analysis had shown that due to differences between the electronic speed of computation and the electromechanical speed of input/output, almost any real-world problem was completely I/O bound, even without making use of the original machine's parallelism. Most computations would still be I/O bound, even after the speed reduction imposed by this modification. Early in 1952, a high-speed shifter was added, which improved the speed for shifting by a factor of five. In July 1953, a 100-word expansion core memory was added to the system, using binary coded decimal, excess-3 number representation. To support this expansion memory, ENIAC was equipped with a new Function Table selector, a memory address selector, pulse-shaping circuits, and three new orders were added to the programming mechanism. Mechanical computing machines have been around since Archimedes' time (see: Antikythera mechanism), but the 1930s and 1940s are considered the beginning of the modern computer era. ENIAC was, like the IBM Harvard Mark I and the German Z3, able to run an arbitrary sequence of mathematical operations, but did not read them from a tape. Like the British Colossus, it was programmed by plugboard and switches. ENIAC combined full, Turing-complete programmability with electronic speed. The Atanasoff–Berry Computer (ABC), ENIAC, and Colossus all used thermionic valves (vacuum tubes). ENIAC's registers performed decimal arithmetic, rather than binary arithmetic like the Z3, the ABC and Colossus. 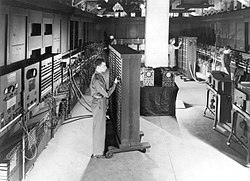 Like the Colossus, ENIAC required rewiring to reprogram until the April 1948. In June 1948, the Manchester Baby ran its first program and earned the distinction of first electronic stored-program computer. 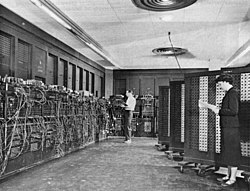 Though the idea of a stored-program computer with combined memory for program and data was conceived during the development of ENIAC, it was not initially implemented in ENIAC because World War II priorities required the machine to be completed quickly, and ENIAC's 20 storage locations would be too small to hold data and programs. The Z3 and Colossus were developed independently of each other, and of the ABC and ENIAC during World War II. Work on the ABC at Iowa State University was stopped in 1942 after John Atanasoff was called to Washington, D.C., to do physics research for the U.S. Navy, and it was subsequently dismantled. The Z3 was destroyed by the Allied bombing raids of Berlin in 1943. As the ten Colossus machines were part of the UK's war effort their existence remained secret until the late 1970s, although knowledge of their capabilities remained among their UK staff and invited Americans. ENIAC, by contrast, was put through its paces for the press in 1946, "and captured the world's imagination". Older histories of computing may therefore not be comprehensive in their coverage and analysis of this period. All but two of the Colossus machine were dismantled in 1945; the remaining two were used to decrypt Soviet messages by GCHQ until the 1960s. The public demonstration for ENIAC was developed by Snyder and Jennings who created a demo that would calculate the trajectory of a missile in 15 seconds, a task that would have taken a weeks for a human computer. For a variety of reasons (including Mauchly's June 1941 examination of the Atanasoff–Berry Computer, prototyped in 1939 by John Atanasoff and Clifford Berry), U.S. Patent 3,120,606 for ENIAC, applied for in 1947 and granted in 1964, was voided by the 1973 decision of the landmark federal court case Honeywell v. Sperry Rand, putting the invention of the electronic digital computer in the public domain and providing legal recognition to Atanasoff as the inventor of the first electronic digital computer. An IBM card reader was attached to Constant Transmitter panel 3 and an IBM card punch was attached to Printer Panel 2. The Portable Function Tables could be connected to Function Table 1, 2, and 3. The School of Engineering and Applied Science at the University of Pennsylvania has four of the original forty panels (Accumulator #18, Constant Transmitter Panel 2, Master Programmer Panel 2, and the Cycling Unit) and one of the three function tables (Function Table B) of ENIAC (on loan from the Smithsonian). The Smithsonian has five panels (Accumulators 2, 19, and 20; Constant Transmitter panels 1 and 3; Divider and Square Rooter; Function Table 2 panel 1; Function Table 3 panel 2; High-speed Multiplier panels 1 and 2; Printer panel 1; Initiating Unit) in the National Museum of American History in Washington, D.C. (but apparently not currently on display). The Science Museum in London has a receiver unit on display. The Computer History Museum in Mountain View, California has three panels (Accumulator #12, Function Table 2 panel 2, and Printer Panel 3) and portable function table C on display (on loan from the Smithsonian Institution). The University of Michigan in Ann Arbor has four panels (two accumulators, High-speed Multiplier panel 3, and Master Programmer panel 2), salvaged by Arthur Burks. The United States Army Ordnance Museum at Aberdeen Proving Ground, Maryland, where ENIAC was used, has Portable Function Table A. The U.S. Army Field Artillery Museum in Fort Sill, as of October 2014, had obtained seven panels of ENIAC that were previously housed by The Perot Group in Plano, Texas. There are accumulators #7, #8, #11, and #17;[note 1] panel #1 and #2 that connected to function table #1, and the back of a panel showing its tubes. A module of tubes is also on display. The United States Military Academy at West Point, New York, has one of the data entry terminals from the ENIAC. The Heinz Nixdorf MuseumsForum in Paderborn, Germany, has three panels (Printer panel 2 and High-speed Function Table) (on loan from the Smithsonian Institution). In 2014 the museum decided to rebuild one of the accumulator panels - reconstructed part has the look and feel of a simplified counterpart from the original machine. ENIAC was named an IEEE Milestone in 1987. 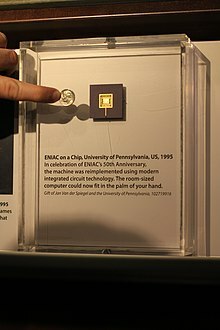 In 1996, in honor of the ENIAC's 50th anniversary, The University of Pennsylvania sponsored a project named, "ENIAC-on-a-Chip", where a very small silicon computer chip measuring 7.44 mm by 5.29 mm was built with the same functionality as ENIAC. Although this 20 MHz chip was many times faster than ENIAC, it had but a fraction of the speed of its contemporary microprocessors in the late 1990s. In 1997, the six women who did most of the programming of ENIAC were inducted into the Women in Technology International Hall of Fame. The role of the ENIAC programmers is treated in a 2010 documentary film titled Top Secret Rosies: The Female "Computers" of WWII by LeAnn Erickson. A 2014 documentary short, The Computers by Kate McMahon, tells of the story of the six programmers; this was the result of 20 years' research by Kathryn Kleiman and her team as part of the ENIAC Programmers Project. In 2011, in honor of the 65th anniversary of the ENIAC's unveiling, the city of Philadelphia declared February 15 as ENIAC Day. The ENIAC celebrated its 70th anniversary on February 15, 2016. ^ Haigh. et. al. list accumulators 7, 8, 13, and 17, but 2018 photos show 7, 8, 11, and 17. ^ Eckert Jr., John Presper and Mauchly, John W.; Electronic Numerical Integrator and Computer, United States Patent Office, US Patent 3,120,606, filed 1947-06-26, issued 1964-02-04; invalidated 1973-10-19 after court ruling on Honeywell v. Sperry Rand. ^ a b Weik, Martin H. "The ENIAC Story". Ordnance. 708 Mills Building - Washington, DC: American Ordnance Association (January–February 1961). Archived from the original on 2011-08-14. Retrieved 2015-03-29. ^ Shurkin, Joel (1996). Engines of the mind: the evolution of the computer from mainframes to microprocessors. New York: Norton. ISBN 978-0-393-31471-7. ^ Moye, William T. (January 1996). "ENIAC: The Army-Sponsored Revolution". US Army Research Laboratory. Archived from the original on 2017-05-21. Retrieved 2015-03-29. ^ Richard Rhodes (1995). "chapter 13". Dark Sun: The Making of the Hydrogen Bomb. p. 251. The first problem assigned to the first working electronic digital computer in the world was the hydrogen bomb. […] The ENIAC ran a first rough version of the thermonuclear calculations for six weeks in December 1945 and January 1946. ^ Scott McCartney p.103 (1999): "ENIAC correctly showed that Teller's scheme would not work, but the results led Teller and Ulam to come up with another design together." "ENIAC on Trial – 1. Public Use". www.ushistory.org. Search for 1945. Retrieved 2018-05-16. The ENIAC machine […] was reduced to practice no later than the date of commencement of the use of the machine for the Los Alamos calculations, December 10, 1945. About the court case (more sources): Honeywell, Inc. v. Sperry Rand Corp..
^ "ENIAC". ENIAC USA 1946. History of Computing Project. 2013-03-13. Retrieved 2016-05-18. ^ Dalakov, Georgi. "ENIAC". History of Computers. Georgi Dalakov. Retrieved 2016-05-23. ^ a b c Wilkes, M. V. (1956). Automatic Digital Computers. New York: John Wiley & Sons. QA76.W5 1956. ^ UShistory.org ENIAC Invetors Retrieved 2016-02-04 USHistory.org ENIAC Inventors. ^ "ENIAC". The Free Dictionary. Retrieved 2015-03-29. ^ Weik, Martin H. (December 1955). Ballistic Research Laboratories Report No. 971: A Survey of Domestic Electronic Digital Computing Systems. Aberdeen Proving Ground, MD: United States Department of Commerce Office of Technical Services. p. 41. Retrieved 2015-03-29. ^ Farrington, Gregory (March 1996). ENIAC: Birth of the Information Age. Popular Science. Retrieved 2015-03-29. ^ "ENIAC in Action: What it Was and How it Worked". ENIAC: Celebrating Penn Engineering History. University of Pennsylvania. Retrieved 2016-05-17. ^ Martin, Jason (1998-12-17). "Past and Future Developments in Memory Design". Past and Future Developments in Memory Design. University of Maryland. Retrieved 2016-05-17. ^ The original photo can be seen in the article: Rose, Allen (April 1946). "Lightning Strikes Mathematics". Popular Science: 83–86. Retrieved 2015-03-29. ^ Clippinger 1948, Section I: General Description of the ENIAC – The Function Tables. ^ Goldstine, Adele (1946). Source (20.4 MB). "A Report on the ENIAC". Ftp.arl.mil. 1 (1). Chapter 1 -- Introduction: 1.1.2. The Units of the ENIAC. ^ Randall 5th, Alexander (2006-02-14). "A lost interview with ENIAC co-inventor J. Presper Eckert". Computer World. Retrieved 2015-03-29. ^ Grier, David (July–September 2004). "From the Editor's Desk". IEEE Annals of the History of Computing. 26 (3): 2–3. doi:10.1109/MAHC.2004.9. Retrieved 2016-05-16. ^ Cruz, Frank (2013-11-09). "Programming the ENIAC". Programming the ENIAC. Columbia University. Retrieved 2016-05-16. ^ Alt, Franz (July 1972). "Archaelogy of computers: reminiscences, 1945-1947". Communications of the ACM. 15 (7): 693–694. doi:10.1145/361454.361528. Retrieved 2016-05-16. ^ Schapranow, Matthieu-P. (1 June 2006). "ENIAC tutorial - the modulo function". Archived from the original on 7 January 2014. Retrieved 2017-03-04. De Mol, Liesbeth; Bullynck, Maarten (2008). "A Week-End Off: The First Extensive Number-Theoretical Computation on ENIAC". In Beckmann, Arnold; Dimitracopoulos, Costas; Löwe, Benedikt (eds.). Logic and Theory of Algorithms: 4th Conference on Computability in Europe, CiE 2008 Athens, Greece, June 15-20, 2008, Proceedings. Springer Science & Business Media. pp. 158–167. ISBN 9783540694052. ^ "ENIAC Programmers Project". eniacprogrammers.org. Retrieved 2015-03-29. ^ Donaldson James, Susan (2007-12-04). "First Computer Programmers Inspire Documentary". ABC News. Retrieved 2015-03-29. ^ Fritz, W. Barkley (1996). "The Women of ENIAC" (PDF). IEEE Annals of the History of Computing. 18 (3): 13–28. doi:10.1109/85.511940. Archived from the original (PDF) on 2016-03-04. Retrieved 2015-04-12. ^ "Meet the 'Refrigerator Ladies' Who Programmed the ENIAC". Mental Floss. Retrieved 2016-06-16. ^ a b c d Light, Jennifer S. (1999). "When Computers Were Women" (PDF). Technology and Culture. 40 (3): 455–483. doi:10.1353/tech.1999.0128 (inactive 2019-03-14). Retrieved 2015-03-09. ^ Grier, David (2007). When Computers Were Human. Princeton University Press. ISBN 9781400849369. Retrieved 2016-11-24. ^ Beyer, Kurt (2012). Grace Hopper and the Invention of the Information Age. London, Cambridge: MIT Press. p. 198. ISBN 9780262517263. ^ a b Isaacson, Walter (18 September 2014). "Walter Isaacson on the Women of ENIAC". Fortune. Archived from the original on 12 December 2018. Retrieved 2018-12-14. ^ a b "Invisible Computers: The Untold Story of the ENIAC Programmers". Witi.com. Retrieved 2015-03-10. ^ a b Gumbrecht, Jamie (February 2011). "Rediscovering WWII's female 'computers'". CNN. Retrieved 2011-02-15. ^ a b "Festival 2014: The Computers". SIFF. Archived from the original on 2015-03-12. Retrieved 2015-03-12. ^ a b Light, Jennifer (July 1999). "When Computers were Women" (PDF). Technology and Culture. 40, 3: 455–483. ^ Sullivan, Patricia (2009-07-26). "Gloria Gordon Bolotsky, 87; Programmer Worked on Historic ENIAC Computer". The Washington Post. Retrieved 2015-08-19. ^ Mazhdrakov, Metodi; Benov, Dobriyan; Valkanov, Nikolai (2018). The Monte Carlo Method. Engineering Applications. ACMO Academic Press. p. 250. ISBN 978-619-90684-3-4. ^ Kean, Sam (2010). The Disappearing Spoon. New York: Little, Brown and Company. pp. 109–111. ISBN 978-0-316-05163-7. ^ a b Light, Jennifer S. (July 1999). "When Computers Were Women". Technology and Culture. 40: 455–483. ^ Kennedy, Jr., T. R. (1946-02-15). "Electronic Computer Flashes Answers". New York Times. Archived from the original on 2015-07-10. Retrieved 2015-03-29. ^ Honeywell, Inc. v. Sperry Rand Corp. , 180 U.S.P.Q. (BNA) 673, p. 20, finding 1.1.3 (U.S. District Court for the District of Minnesota, Fourth Division 1973) ("The ENIAC machine which embodied 'the invention' claimed by the ENIAC patent was in public use and non-experimental use for the following purposes, and at times prior to the critical date: ... Formal dedication use February 15, 1946 ..."). ^ Evans, Claire L. (2018-03-06). Broad Band: The Untold Story of the Women Who Made the Internet. Penguin. p. 51. ISBN 9780735211766. ^ Scott McCartney p.140 (1999): Eckert gave eleven lectures, Mauchly gave six, Goldstine gave six. von Neumann, who was to give one lecture, didn't show up; the other 24 were spread among various invited academics and military officials. ^ a b c d e f "Eniac". Epic Technology for Great Justice. Retrieved 2017-01-28. ^ a b Goldstine, Adele K. (10 July 1947). Central Control for ENIAC. p. 1. Unlike the later 60- and 100-order codes this one [51 order code] required no additions to ENIAC’s original hardware. It would have worked more slowly and offered a more restricted range of instructions but the basic structure of accumulators and instructions changed only slightly. By July 1947 von Neumann was writing: "I am much obliged to Adele for her letters. Nick and I are working with her new code, and it seems excellent." ^ Pugh, Emerson W. (1995). "Notes to Pages 132-135". Building IBM: Shaping an Industry and Its Technology. MIT Press. p. 353. ISBN 9780262161473. ^ Haigh, Priestley & Rope 2014, pp. 44-45. ^ Haigh, Priestley & Rope 2014, p. 44. ^ a b Goldstine 1972, 233-234, 270; search string: eniac Adele 1947. ^ a b Haigh, Priestley & Rope 2014, pp. 47-48. ^ Clippinger 1948, Section VIII: Modified ENIAC. ^ Fritz, W. Barkley (1949). "Description and Use of the ENIAC Converter Code". Technical Note (141). Section 1. – Introduction, p. 1. At present it is controlled by a code which incorporates a unit called the Converter as a basic part of its operation, hence the name ENIAC Converter Code. These code digits are brought into the machine either through the Reader from standard IBM cards* or from the Function Tables (...). (...) * The card control method of operation is used primarily for testing and the running of short highly iterative problems and is not discussed in this report. ^ Haigh, Thomas; Priestley, Mark; Rope, Crispin (July–September 2014). "Los Alamos Bets On ENIAC: Nuclear Monte Carlo Simulations 1947-48". IEEE Annals of the History of Computing. 36 (3): 42–63. doi:10.1109/MAHC.2014.40. Retrieved 2018-11-13. ^ Thomas Haigh; Mark Priestley; Crispen Rope (2016). ENIAC in Action:Making and Remaking the Modern Computer. MIT Press. pp. 113–14. ISBN 978-0-262-03398-5. ^ Thomas Haigh; Mark Priestley; Crispen Rope (2016). ENIAC in Action:Making and Remaking the Modern Computer. MIT Press. p. 153. ISBN 978-0-262-03398-5. ^ "Programming the ENIAC: an example of why computer history is hard | @CHM Blog | Computer History Museum". www.computerhistory.org. ^ Haigh, Thomas; Priestley, Mark; Rope, Crispin (January–March 2014). "Reconsidering the Stored Program Concept". IEEE Annals of the History of Computing. 36 (1): 9–10. ^ Haigh, Priestley & Rope 2014, pp. 48-54. ^ Copeland 2006, p. 106. ^ Copeland 2006, p. 2. ^ a b c d e f g Haigh, Thomas; Preistley, Mark; Rope, Xrispen (2016). ENIAC in Action. MIT Press. pp. 46, 264. ISBN 978-0-262-03398-5. ^ Meador, Mitch (2014-10-29). "ENIAC: First Generation Of Computation Should Be A Big Attraction At Sill". The Lawton Constitution. Retrieved 2015-04-08. ^ "Meet the iPhone's 30-ton ancestor: Inside the project to rebuild one of the first computers". TechRepublic. Bringing the Eniac back to life. ^ "Milestones:Electronic Numerical Integrator and Computer, 1946". IEEE Global History Network. IEEE. Retrieved 2011-08-03. ^ "Looking Back At ENIAC: Commemorating A Half-Century Of Computers In The Reviewing System". The Scientist Magazine®. ^ Van Der Spiegel, Jan (1996). "PENN PRINTOUT - The University of Pennsylvania's Online Computing Magazine". Retrieved 2016-10-17. ^ Van Der Spiegel, Jan (1995-05-09). "ENIAC-on-a-Chip". University of Pennsylvania. Retrieved 2009-09-04. ^ Brown, Janelle (1997-05-08). "Wired: Women Proto-Programmers Get Their Just Reward". Retrieved 2015-03-10. ^ "ENIAC Programmers Project". ENIAC Programmers Project. Retrieved 2016-11-12. ^ "Resolution No. 110062: Declaring February 15 as "Electronic Numerical Integrator And Computer (ENIAC) Day" in Philadelphia and honoring the University of Pennsylvania School of Engineering and Applied Sciences" (PDF). 2011-02-10. Retrieved 2014-08-13. ^ Kim, Meeri (2016-02-11). "70 years ago, six Philly women became the world's first digital computer programmers". 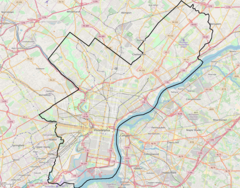 Retrieved 2016-10-17 – via www.phillyvoice.com. Clippinger, R. F. (29 September 1948). Source. "A Logical Coding System Applied to the ENIAC". Ballistic Research Laboratories Report (673). Archived from the original on 2010-01-03. Retrieved 2010-01-27. Goldstine, Herman H. (1972). The Computer: from Pascal to von Neumann. Princeton, New Jersey: Princeton University Press. ISBN 978-0-691-02367-0. Haigh, Thomas; Priestley, Mark; Rope, Crispin (April–June 2014). "Engineering 'The Miracle of the ENIAC': Implementing the Modern Code Paradigm". IEEE Annals of the History of Computing. 36 (2): 41–59. doi:10.1109/MAHC.2014.15. Retrieved 2018-11-13. Haigh, Thomas; Priestley, Mark; Rope, Crispin (2016). ENIAC in Action: Making and Remaking the Modern Computer. MIT Press. ISBN 978-0-262-53517-5. McCartney, Scott (1999). ENIAC: The Triumphs and Tragedies of the World's First Computer. Walker & Co. ISBN 978-0-8027-1348-3. Stuart, Brian L. (2018). "Simulating the ENIAC [Scanning Our Past]". Proceedings of the IEEE. 106 (4): 761–772. doi:10.1109/JPROC.2018.2813678. Stuart, Brian L. (2018). "Programming the ENIAC [Scanning Our Past]". Proceedings of the IEEE. 106 (9): 1760–1770. doi:10.1109/JPROC.2018.2843998. Stuart, Brian L. (2018). "Debugging the ENIAC [Scanning Our Past]". Proceedings of the IEEE. 106 (12): 2331–2345. doi:10.1109/JPROC.2018.2878986. Dyson, George (2012). Turing's Cathedral: The Origins of the Digital Universe. New York City: Pantheon Books. ISBN 978-0-375-42277-5. Lukoff, Herman (1979). From Dits to Bits: A personal history of the electronic computer. Portland, Oregon, USA: Robotics Press. ISBN 978-0-89661-002-6. LCCN 79-90567. Tompkins, C. B.; Wakelin, J. H.; High-Speed Computing Devices, McGraw-Hill, 1950. Stern, Nancy (1981). From ENIAC to UNIVAC: An Appraisal of the Eckert-Mauchly Computers. Digital Press. ISBN 978-0-932376-14-5. "ENIAC Operating Manual" (PDF). www.bitsavers.org. 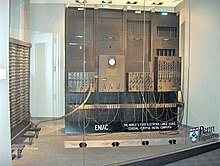 Wikimedia Commons has media related to ENIAC. Interview with Eckert Transcript of a video interview with Eckert by David Allison for the National Museum of American History, Smithsonian Institution on February 2, 1988. An in-depth, technical discussion on ENIAC, including the thought process behind the design. Oral history interview with J. Presper Eckert, Charles Babbage Institute, University of Minnesota. Eckert, a co-inventor of ENIAC, discusses its development at the University of Pennsylvania's Moore School of Electrical Engineering; describes difficulties in securing patent rights for ENIAC and the problems posed by the circulation of John von Neumann's 1945 First Draft of the Report on EDVAC, which placed the ENIAC inventions in the public domain. Interview by Nancy Stern, 28 October 1977. Oral history interview with Carl Chambers, Charles Babbage Institute, University of Minnesota. Chambers discusses the initiation and progress of the ENIAC project at the University of Pennsylvania Moore School of Electrical Engineering (1941–46). Oral history interview by Nancy B. Stern, 30 November 1977. Oral history interview with Irven A. Travis, Charles Babbage Institute, University of Minnesota. Travis describes the ENIAC project at the University of Pennsylvania (1941–46), the technical and leadership abilities of chief engineer Eckert, the working relations between John Mauchly and Eckert, the disputes over patent rights, and their resignation from the university. Oral history interview by Nancy B. Stern, 21 October 1977. Oral history interview with S. Reid Warren, Charles Babbage Institute, University of Minnesota. Warren served as supervisor of the EDVAC project; central to his discussion are J. Presper Eckert and John Mauchly and their disagreements with administrators over patent rights; discusses John von Neumann's 1945 draft report on the EDVAC, and its lack of proper acknowledgment of all the EDVAC contributors. Gumbrecht, Jamie (8 February 2011). "Rediscovering WWII's 'computers'". CNN.com. Retrieved 9 February 2011. This page was last edited on 7 April 2019, at 23:44 (UTC).